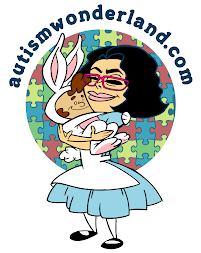 AutismWonderland: Out of sight. Out of mind? I arrived late last night from AWP - my very first writers conference. The two day break felt good. To be in the presence of writers, editors, professors, agents and students who all shared my passion for writing was inspiring. Exciting. Promising. To do something specifically and selfishly for myself felt good. And I felt guilty. While away I had a nightmare. I was in a hotel with The Boy when I sent him away to go home on his own. To get on the train by himself at five years old. A five year old boy with autism, forced to find his way home via public transportation. I abandoned him. In my nightmare, I felt guilty for sending him on his way and left the hotel to find him. I walked up and down the street and I couldn't find him. Then I woke up. That morning, I called home to make arrangements for The Husband to pick me up from the train station and asked to speak to The Boy. (The Boy hates talking on the phone. He'll say hello and then push the phone away. And if he allows the phone to be held to his ear, he'll stay silent, breathing into the phone.) I felt lucky to get a "Hi Mommy." Then The Husband asks The Boy: Do you want to go pick up Mommy? The Boy responds: NO! I do not wish to pick up Mommy. The Husband laughed. But I was hurt. Was The Boy angry? Did he feel abandoned? Did he even care that I was gone? My guilt was confirmed. I had abandoned both my son and husband. To do something for myself. I was spending money, money that could have gone into the savings for an attorney or advocate. What kind of mother was I? When I finally arrived home late last night, The Boy was still up, laying in his bed. (Our neighbor was watching him.) I crawled in beside him, kissed his cheeks. He smiled at me, his hands touched my face - he lifted up my glasses as if to confirm it was really me. He looked me in the eye - really looked at me and continued to smile. He wasn't angry. He didn't feel abandoned. He had, in fact, missed me. It wasn't a natural emotion for him to convey or even understand. But I knew, he was happy to see me. That my presence made a difference. He let me snuggle against him and he wrapped his hand around mine not wanting to let go. I'll say it again, you're a great mom and of course it was that he missed you. Never feel guilty about doing something for yourself once in a while you deserve it. Guilt is a natural feeling. We spent endless amount of hours, days and years being right there for them when they need us. It feels wrong not to be right there when they probably need us. But all the time we spent together has prepared them. They can say to themselves "It's ok because my mommy is going to be right back." Even if right back is two days later... Guess what ...you came back and they learned know how to function without you for that moment and the guilt melts away.